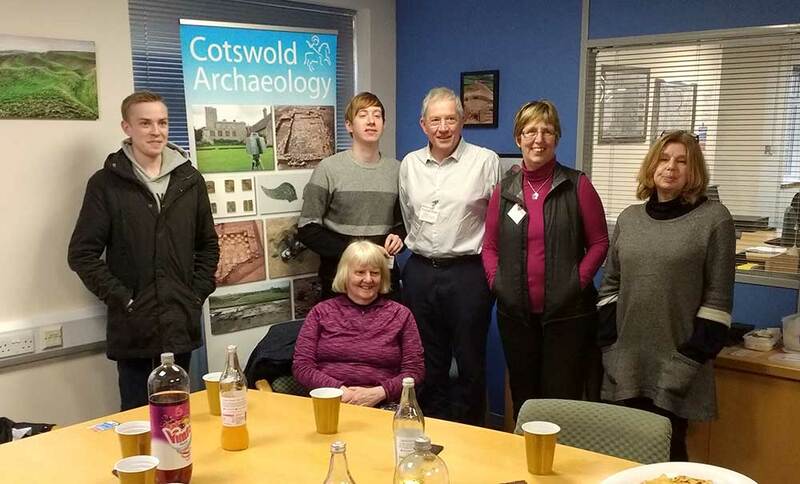 On 9th March Cotswold Archaeology held a thank-you day for volunteers who work in the Cirencester office. After a busy year of hard toil we thought it was about time that we thanked our brilliant volunteers by treating them to a series of talks from some of our experts. 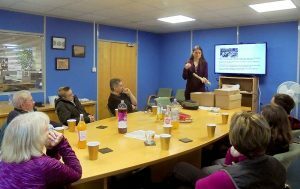 The talks focussed on archaeological projects the volunteers had worked on, whilst others looked at museum store projects also involving volunteers. Some talks were just an excuse to look at recent amazing finds we have been working on! This is always a special occasion for staff and volunteers alike. Our volunteers come from a variety of backgrounds but all have a love of archaeology. We train our volunteers in a number of tasks, usually introducing them to things they might never have tried before. Our projects range from working on skeletons from Anglo-Saxon execution cemeteries to preparing finds from large city-centre sites for museum deposition. We also run museum store projects where volunteers help local museums assess what they hold and the best way to preserve their collections for the future. The talks were followed up by ‘a good spread’. Sandwiches and fizzy pop were consumed whilst beautiful (and carefully handled) artefacts were admired. Although we have had to temporarily suspend our volunteer programme at Cirencester, we are looking forward to further exciting volunteer projects and the next thank-you day for volunteers! Cotswold Archaeology Nominated for Two Current Archaeology Awards! The 2018 Current Archaeology Awards nominations have been announced, and we are fortunate enough to have been nominated for two awards, both in the Research Project of the Year category! 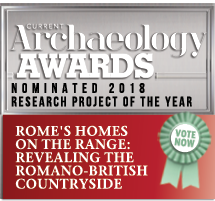 This nomination is for our work as partners with the University of Reading on the Roman Rural Settlement Project. This major project, funded by the Leverhulme Trust and Historic England, drew together published and unpublished excavated evidence for Roman rural settlement, from over 2500 sites, in order to produce a new synthesis of the countryside of Britain during the Roman period. The results of the project are presented in three volumes, dealing respectively with the rural settlement pattern, the rural economy, and life and death in the countryside. The first two of these volumes are now published! Additionally, the project produced an online resource, which makes the data collected by the project (including site plans and information about artefacts and environmental evidence) available to anyone who wishes to use it. This resource is hosted by the Archaeology Data Service. 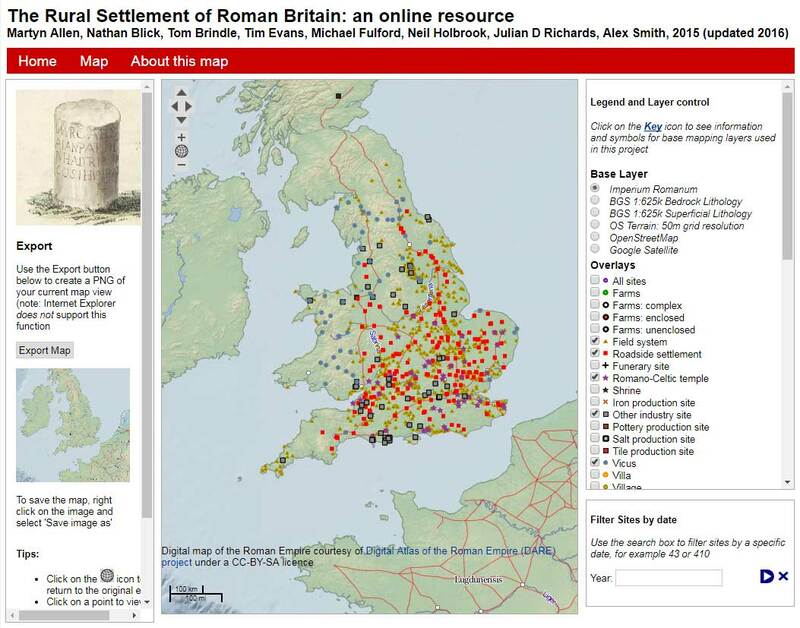 It is no overstatement to say that this project has been immensely influential, and its results are transforming our understanding of rural settlement, industry and life in Roman Britain. 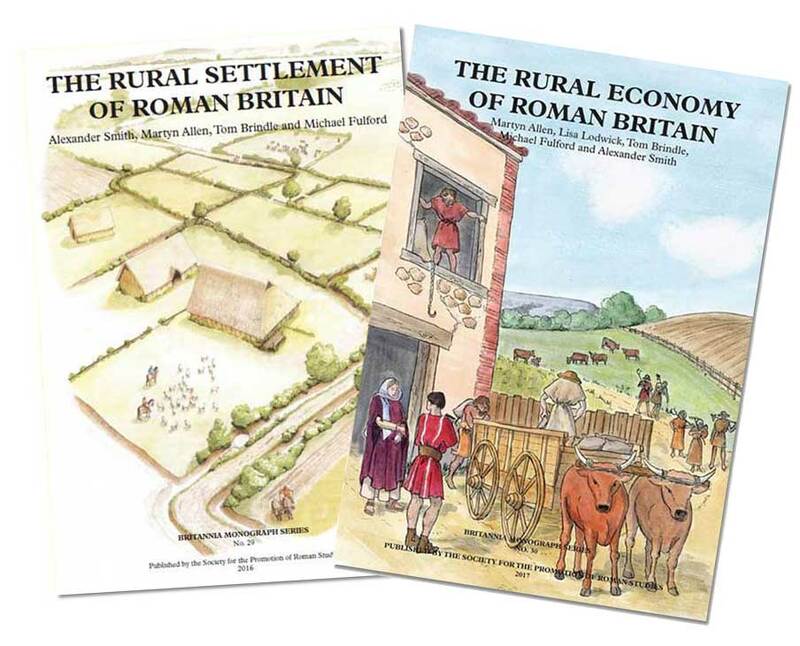 ‘The Rural Settlement of Roman Britain Project’ and its outputs will doubtless serve as an exemplar for future initiatives that seek to address rural settlement in the Western Roman Empire, and will provide a vital research tool for future work in England and Wales. 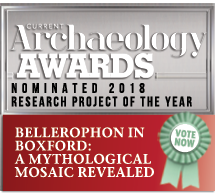 This nomination relates to our work on a community project, ‘ Revealing Boxford’s Ancient Heritage’, a joint project involving CA, the Boxford History Project, and the Berkshire Archaeology Research Group. Funded by the Heritage Lottery Fund, over three years the project has investigated three closely linked Roman sites near to the village of Boxford in West Berkshire. 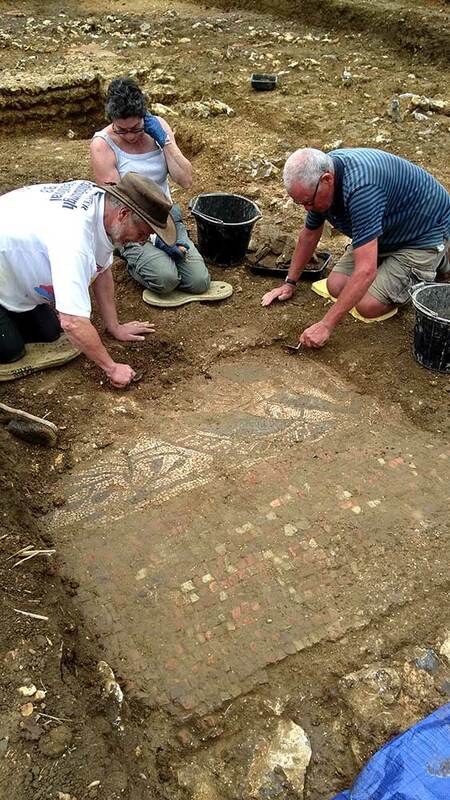 This summer our excavation revealed a spectacular Roman mosaic (you may have heard of it! 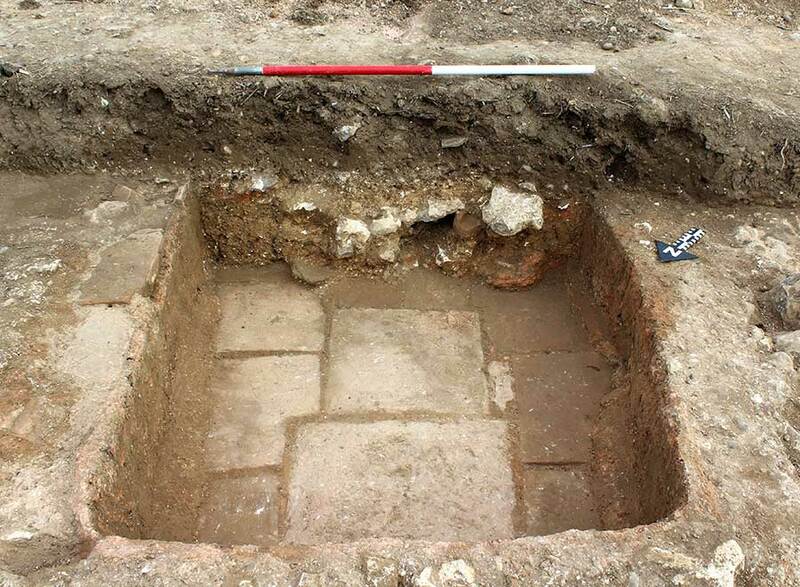 ), associated with a late Roman villa. The figurative mosaic is packed with mythical characters and beasts based on Greek legend, including a scene depicting the hero Bellerophon, fighting the Chimera. Other figures on the mosaic possibly include Hercules fighting a centaur, Cupid holding a wreath, and depictions of telamons in the corners. 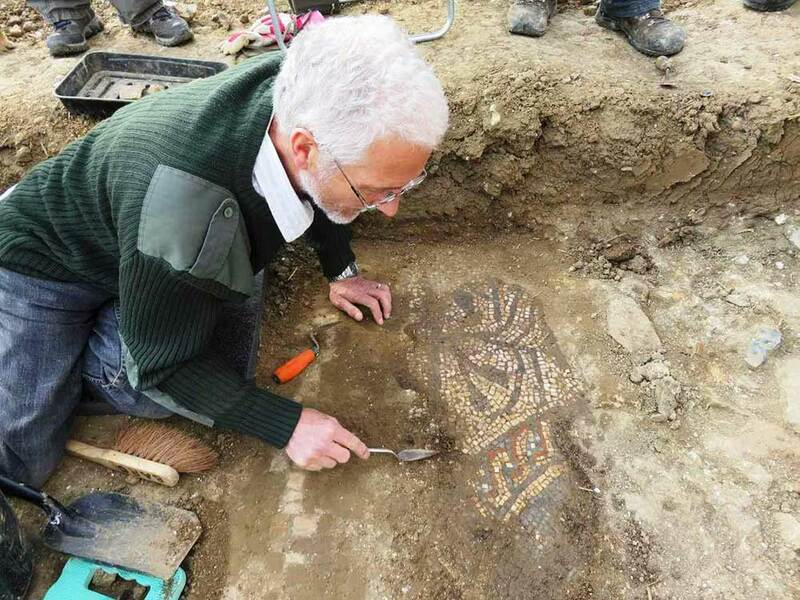 This is without question the most exciting mosaic discovery made in Britain in the last fifty years and must take a premier place amongst those Romano-British works of art that have come down to modern Britons. All nominations for the Current Archaeology Awards are based on articles and books featured within Current Archaeology over the last 12 months. Voting for the awards is live (until 5th February 2018) and is open to everyone. We’d be very grateful for your support! For the first time, non-divers can explore the protected historic wreck site of the 350-year-old warship the London – one of England’s most important 17th-century shipwrecks – which lies in two parts in the Thames estuary off Southend Pier. 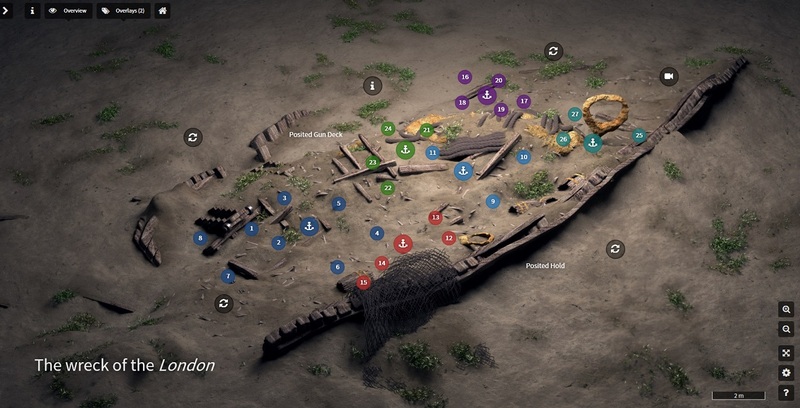 Historic England has commissioned Cotswold Archaeology, in collaboration with ArtasMedia, CyanSub and MSDS Marine, to create a 3D virtual tour of the London wreck site, which is extraordinarily well preserved. The ship blew up on 7th March 1665 after gunpowder stored on board caught fire during a journey from Chatham to the Hope, near Gravesend. The ship was en route to collect final supplies after being mobilised to take part in the Second Anglo-Dutch War of 1665–7. Since 2010, the site has been monitored and investigated by the licensee, Steve Ellis, and his team in collaboration with Cotswold Archaeology (since 2014), and previously with Wessex Archaeology. 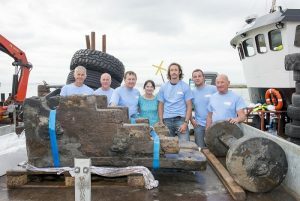 A small part of the wreck was also excavated by Historic England in 2015, and an extremely rare wooden gun carriage was recovered as well as more than 700 artefacts, some of which are already on display at the Southend Museum. The dive trail takes the form of an interactive website which includes images, video, audio commentary and panoramas, outlining the history of the ship, its loss, and its re-discovery, as well as the archaeological investigations that have been conducted on site in recent years. The website has sections that provide details of the ship’s construction, the weaponry it carried, nautical and other equipment, and personal items of the crew. The site also provides details of the ongoing analysis and conservation of some of the rare items that have been recovered that will enhance our knowledge and understanding of life on board a 17th-century warship. For the virtual tour of the wreck visit The London on CloudTour. 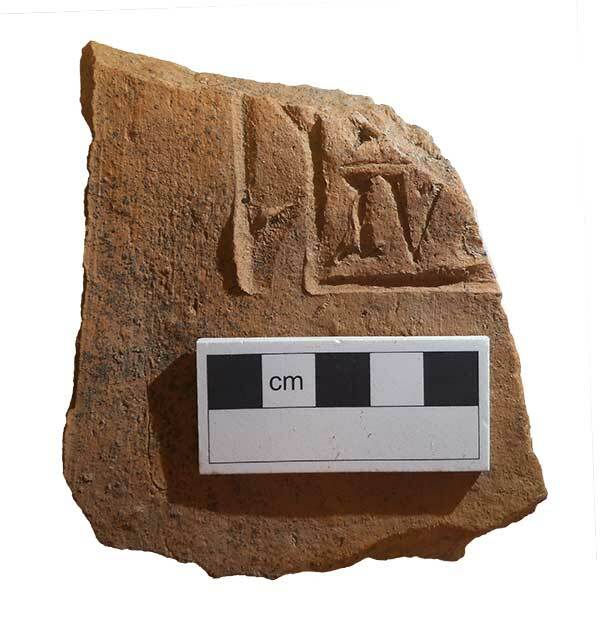 Dr Peter Warry FSA is an expert on Roman ceramic building material, and has just published an article on the use of stamped Roman tiles in Gloucestershire. Among other things, in his new article Peter posits that Hucclecote villa, situated to the east of Gloucester, played an important role as a sort of recycling depot for tile. Peter’s work on the tile was supported in no small way by CA’s Hazel O’Neill, Post-Excavation Supervisor, who managed a team of volunteers as part of the Gloucester Museum Store Project. This successful initiative consolidated a number of unorganised excavation archives and finds assemblages held by Gloucester museum, dating back to the 1980s, ordering the material and bringing the archives in line with modern curation standards. 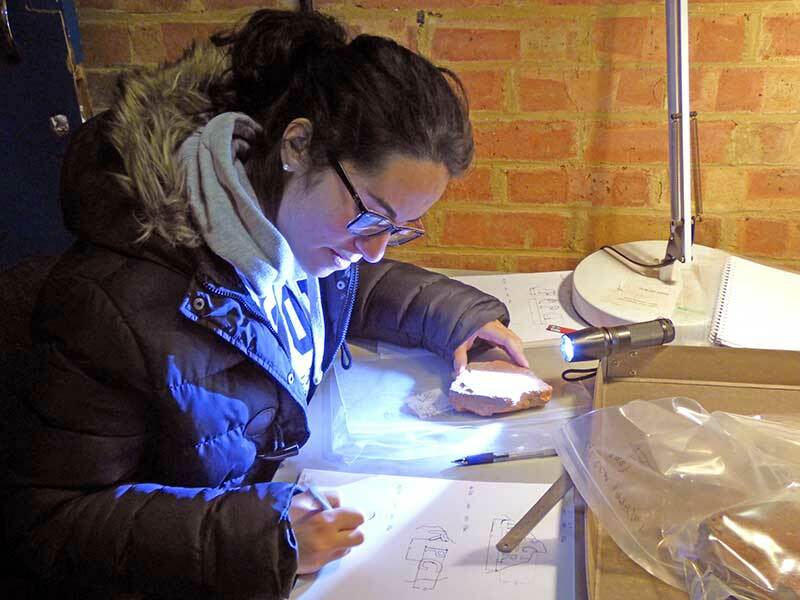 The work of Hazel and her team enabled previously unreported Roman tiles (and other finds) within these excavation archives to be catalogued and reported on for the first time. One box of stamped tile had been missing for several years, having been searched for unsuccessfully by several people previously. It was finally rediscovered lurking in a store by a member of Hazel’s team. The missing box, from a site at Commercial Road, carried a different site name on the front (the right name was on the back, which couldn’t be seen), was not in the museum’s catalogue and was known only from a 1988 report by Tim Darvill. However, this box contained around 100 stamped tiles – roughly a quarter of the entire corpus of Gloucester civic stamped tiles. Dr Warry was so happy about the rediscovery that he kissed the box! An abstract can be viewed online. 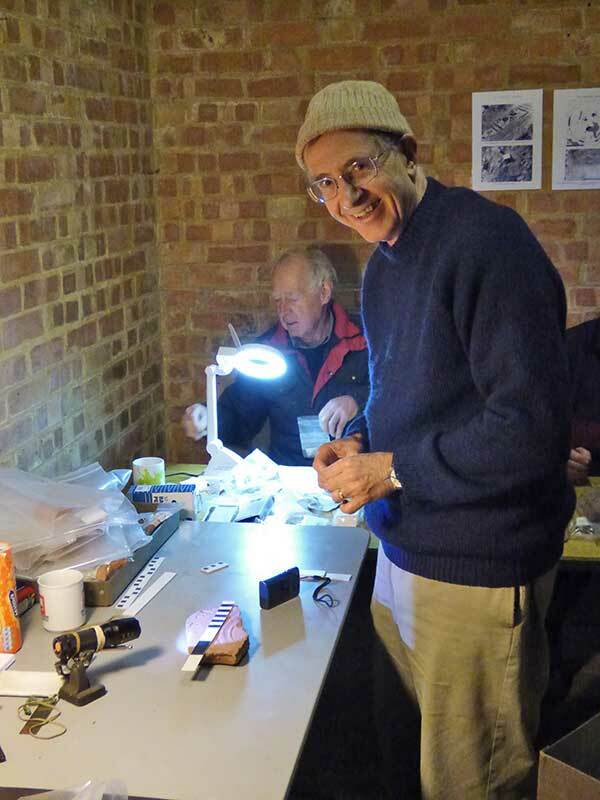 Over the weekend we heard the very sad news that Andrew Lyle, one of our long-standing volunteers on the Boxford project, passed away on Saturday morning. Matt Nichol, who worked with Andrew on the project, has these words to say about him. Andrew Lyle was an incredibly hard working, funny and passionate local Boxford guy whose contribution to the Boxford dig over the years was immense. He was a great team member -always upbeat, always keen to muck in with the heavy excavation, and on quite a few occasions over years I was invited around to his house after a day’s digging for drinks and a meal with he and his wife Tina. During the very first season in 2013, after the excavation had ended, I was invited around to Andrew’s house so I could complete all site paperwork with another volunteer who had kindly offered to help; he went on to study a degree in archaeology (and became a military officer in the TA). Both volunteers influenced that season of excavation, but Andrew would take this one step further – he was a great cook and entertainer. I will never forget that evening especially. Andrew will be greatly missed. 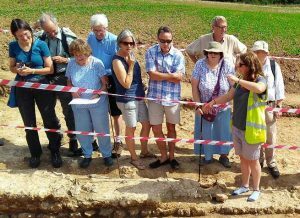 Since 2015 Cotswold Archaeology has been involved in a three year community archaeology project “Revealing Boxford’s Ancient Heritage”. A joint project involving the BHP (Boxford History Project), the Berkshire Archaeology Research Group and CA, the project was funded by the Heritage Lottery Fund and involved investigating three closely linked Roman sites near to the village of Boxford in West Berkshire. 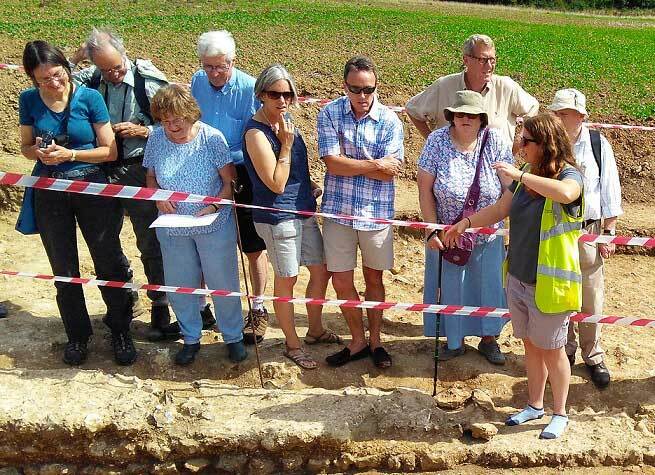 Supported by our archaeologists, the local community groups and volunteers explored the function, status, chronology, extent and relationship of the three sites, which represented a significant focus of high-status Roman occupation in the Lambourn Valley. During the first year of the project such investigations uncovered a large villa and bath house, with a farmstead following in the second year. Following on from a successful two years, the final year of the project did not disappoint! This year kicked off to a great start, with finds recorded on the first day comprising a child’s bracelet and coins. Led by CA’s Matt Nichol, with the help of Agata, Alice, Keighley and Joe, the volunteers worked quickly to uncover the remains of the main villa, a probable barn, a gateway into the courtyard and other associated features. Finds also include Roman pottery and tile (one of which is complete and has an animal paw print), animal bone and much more. Although the villa was of modest size and of a common design, with a series of rooms adjoining a corridor running the full length of its front, it had evidently been subject to significant investment and upgrades over time. These included the addition of a bath suite with a small cold water plunge pool located in the corridor at the villa’s northern end. The most spectacular addition, however, was a mosaic placed in a room at the southern end of the building. 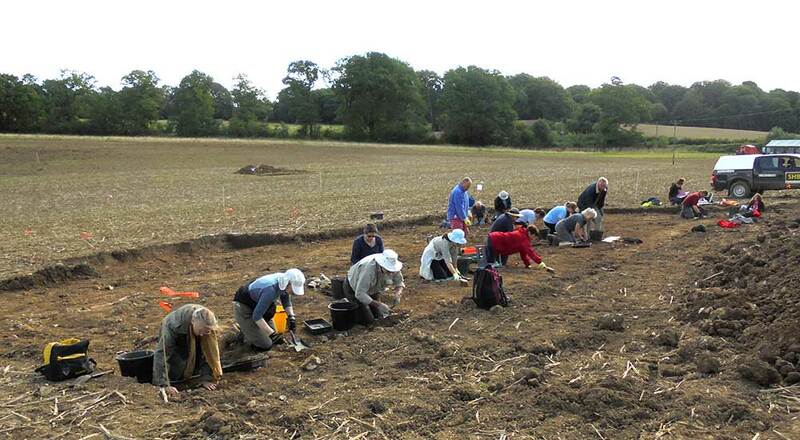 Volunteers hard at work on the potential site of a Roman barn. Our star find of the project was discovered during the initial stripping of the site, and measured over 6m in length. The mosaic comprised a highly decorated central panel surrounded by a plain border. 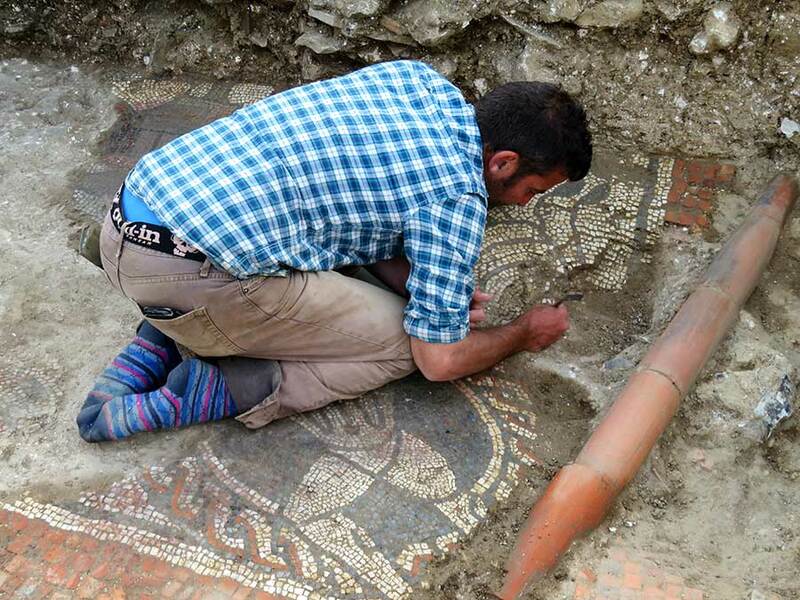 Despite only one side of the mosaic being revealed within the trench, it is clear that the figurative mosaic is packed with mythical characters and beasts based on Greek legends. For those interested in the iconography, Anthony Beeson suggests that the sideways scene may be interpreted as Bellerophon, a hero of Greek mythology, at the court of either Iobates or Proteus. Bellerophon was sent to kill the chimera, a fire breathing monster with the head of a lion, the torso of a goat and a serpent’s tail. The chimera illustrated on the mosaic at Boxford is one of only two known from Britain which turns back to attack in the traditional manner. The others all flee. Other figures on the mosaic possibly include Hercules fighting a centaur, Cupid holding a wreath, and depictions of telamons in the corners, who appear to hold up the central panel. 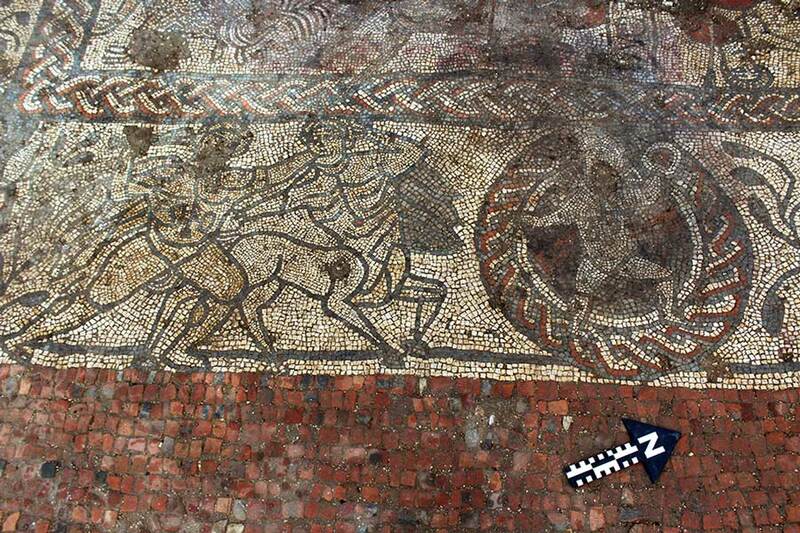 Other examples of Romano-British Bellerophon mosaics are known from Frampton and Hinton St Mary in Dorset, Lullingstone in Kent and Croughton, near Brackley in Northamptonshire. The Open Day last Saturday was attended by over 250 people who were able to view finds from the excavation, as well as the villa and mosaic. While the site has now been backfilled, it is hoped that future investigations will allow us to further our understanding of some of the features discovered, including the bath suite, and will reveal the mosaic in its entirety. Steve Clark from the Berkshire Archaeology Research Group also commented “We’re very grateful for all the support provided by Neil Holbrook and Duncan Coe over the course of project and for the professionalism and patience of CA’s field staff in guiding us through the excavations. We’ve been incredibly lucky to have been led by somebody like Matt who has gone the extra mile to get the most out of our limited time on site each year”. Our own Duncan Coe, who has been involved with the Boxford project for the last 6 years, stated that “this is one of the best examples of a project where a local community, local volunteer archaeologists and professional archaeologists have worked together to produce some truly inspiring results. We hope that the local community take away a greater understanding of the world around them and the time depth within the place they call home”.